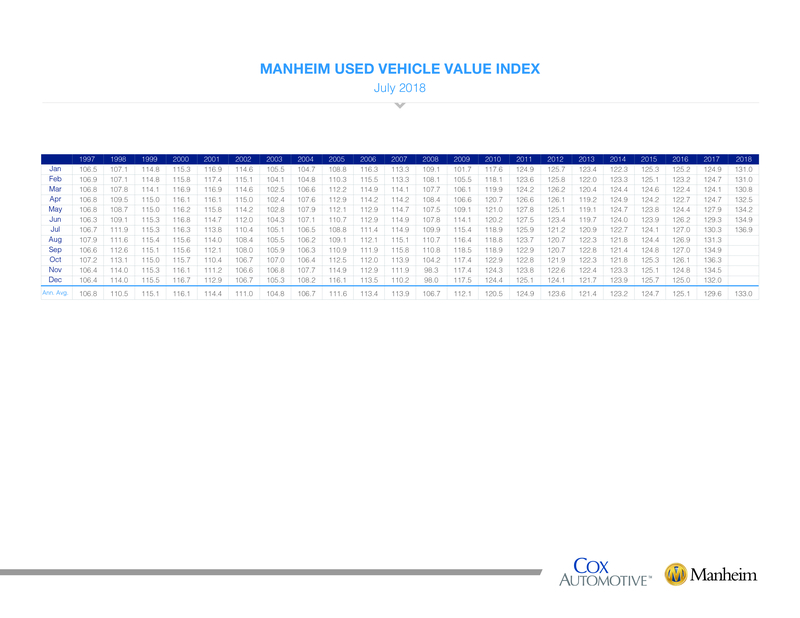 July Manheim Used Vehicle Value Index: Used Vehicle Values Increase to New Record - Cox Automotive Inc.
Wholesale used vehicle prices (on a mix-, mileage-, and seasonally adjusted basis) increased 1.51% month-over-month in July. 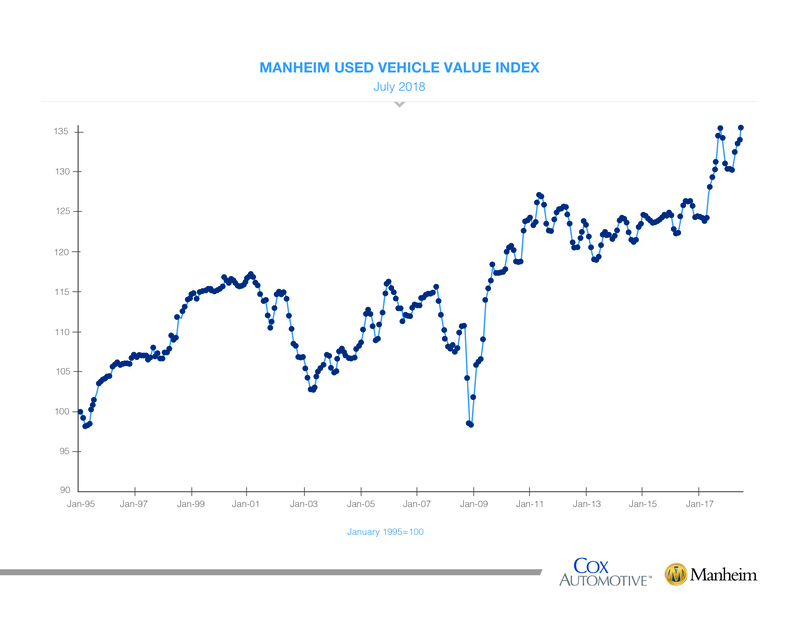 This brought the Manheim Used Vehicle Value Index to 136.9, which was a 5.1% increase from a year ago and the highest level ever for the series. Looking at trends in weekly Manheim Market Report (MMR) prices, the abnormal summer bounce that started in June continued and strengthened in July. Correspondingly, the best-selling cars at Manheim are worth more today than a month ago, and many vehicles are worth more now than a year ago. Price comparisons to last year will be tougher through the rest of the year; but recent weekly increases were higher than last year, keeping current price performance ahead of last year. 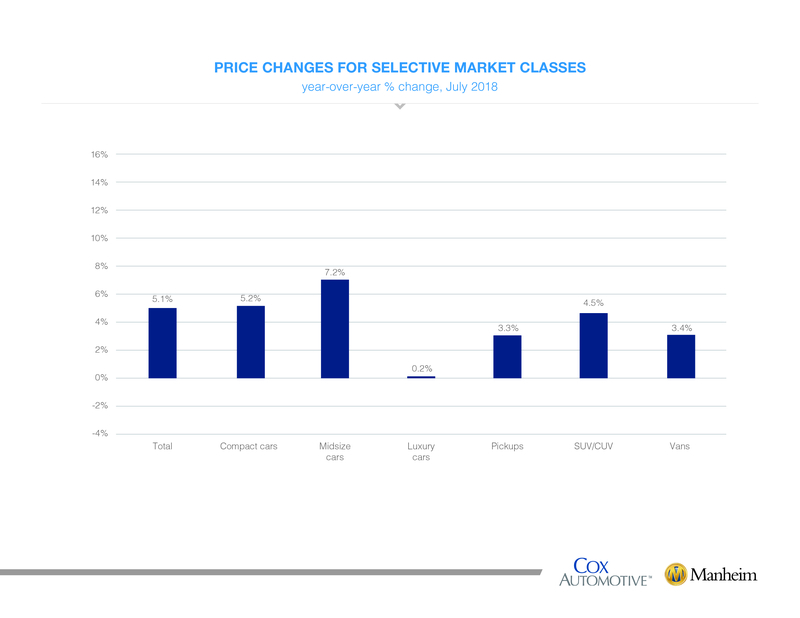 The strange summer price appreciation in used cars is partly a function of a strong economy at its peak, with mounting affordability challenges for the consumer that favor growth in used vehicle sales at the expense of new. These conditions have supported strong used vehicle prices for over a year. The catalyst for even stronger price movement this summer is the fear of import tariffs’ leading to higher prices in the future. Higher prices and the related declining level of supply create a psychological feedback loop for consumers, encouraging buying now with the expectation that prices may be higher later.